1078-1081 The third so named Nicephorus was a leading military commander at the height of a disorder afflicting all corners of the empire. Like many other less successful generals, he renounced his allegiance to Michael VII and began preparations for a siege against Constantinople. On hearing of the impending approach Michael decided he had had enough and took the by now familiar power exit of seeking sanctuary in a monastery; clearing the way thus for Botoniates's bloodless entry into the capital and onto the throne. But the new emperor failed to quiet the dissent that was still raging. He opened the fiscal taps in hopes of buying the support of key personnel but this only made those not on the pay roster that much unhappier while hastening the decline of an already precarious economy. As situations spiralled out of control, Mary, the emperor's wife, came up with a last-ditch plan. Between the two they adopted Alexius, the most popular general, as son and heir of the imperial couple. By doing so the two hoped that, in consideration of the emperor's old age, a changing of the guard suitable to the people would be soon in coming. But Alexius, not feeling the least guilt, repaid their gratitude by assembling an army and marching towards the capital at once with the intention of deposing Botoniates a little sooner than nature had intended. Seeing that all was lost he prudently walked from the palace to a nearby church and checked the imperial robe at the door. 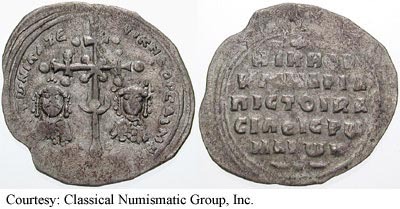 SB 1881, DOC III 3b AU (Electrum) Histamenon Obv: Christ enthroned facing. Rev: Nicephorus standing facing, holding labarum with X on shaft and globus cruciger. (Constantinople). 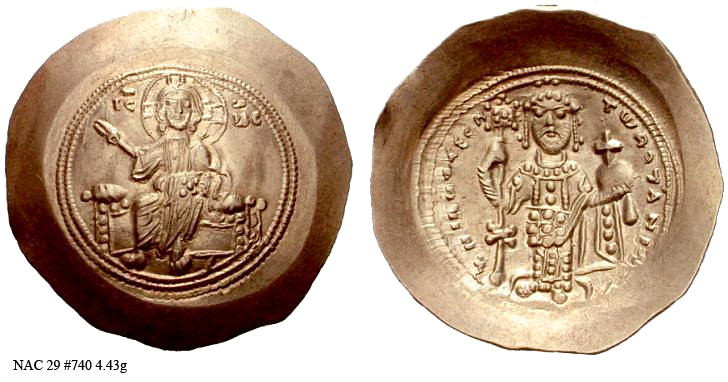 SB 1882, DOC III 2 AU (Electrum) Histamenon Obv: Christ enthroned on square-backed throne. Rev: Nicephorus standing on footstool, holding plain-shafted labarum and globus cruciger. (Constantinople). 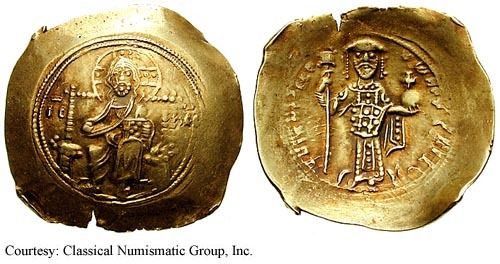 SB 1883, DOC III 1 AU (Electrum) Histamenon Obv: Christ bust facing, raising hand and holding Gospels. Rev: Nicephorus III crowned bust facing, wearing loros, holding cross and globus cruciger. (Constantinople). SB 1886, DOC III 6 AR Miliaresion Obv: Crowned busts of Nichephorus and Maria; large ornamented cross-crosslet between them. Rev: -+-/NIKHFR/KAIMAPIA/О ICTOIRA/CIО›EICPW/MAIWN/-вЂў- - Legend in five lines. $1,200 9/19/01.